When I heard of Robin Williams' suicide I wept, exclaiming audibly over the loss of this extraordinary man. I have been moved by celebrity death before (Phil Hoffman being one example), but the news of Robin's death actually hurt to hear and I've spent some time puzzling over why, and whether we have the right to grieve for a person it could be argued we don't know. This post is partly inspired by Heather Hill's words which you can read here. When I think of Robin Williams I think of all the times in my life when he was a presence, whether it's through watching Mrs Doubtfire or Hook on a rainy afternoons as a child or singing along to his frenetic performance as the Genie in Aladdin. I think of how I wept at Patch Adams, a film I've not been able to watch since, it moved me so much, and how I cowered at his sinister performance in 24 Hour Photo. I think about the times A and I watched his stand up comedy on lazy days and how much I loved The Birdcage when he first introduced it to me. In a way he's been with me my whole life. As human beings, we present many versions of ourselves to the world; we are different things to different people, whether it's colleagues, acquaintances, strangers, friends, or loved ones. These components of our personalities come together to make us who we are. 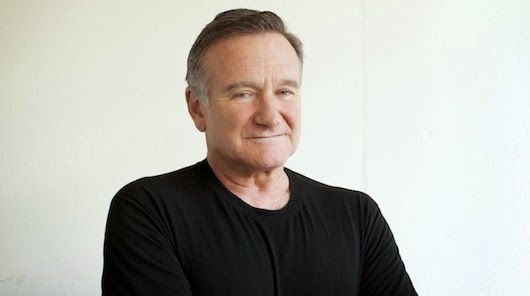 We were all lucky enough to know Robin Williams' public self, and thus our experience of grief will not be the same as for those who knew him personally, but it is still valid. Here is a man whose irrefutable talent gave us so much pleasure, a man whose life ended in the most tragic of ways. Grieving for a person who gave so much to others but who ended his life in despair is not self-involved or hollow, but rather shows our capacity for empathy and that is never something to feel ashamed of. I am going to leave you with a poem (trigger warning) and my favourite scene from The Birdcage.